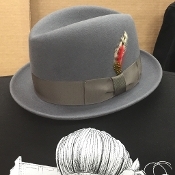 The new gray wool lowrider hat American made 100 percent wool hats in classic style. Nylon lined, Leather inside head band, with a solid color hat band.Many styles with a snap brim. These are made custom for Greenspan's. Greenspan's has been selling these style in our store for over 50 years. It has a snap brim that can flip up or down.